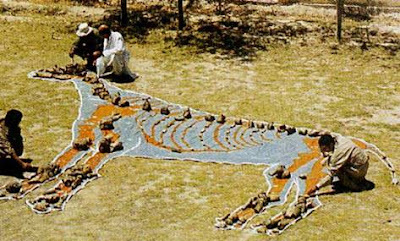 This mammal is called Baluchitherium (The Beast of Balochistan). So far the fossils of this mammal have only been found in Balochistan and Central Asia. According to a BBC news report of May 10, 1999, "Baluchitherium is an extinct rhinoceros that lived during the Tertiary Period about 20 to 30 million years ago. With its long neck and legs, it was thought to feed high up in the trees. However, unlike the modern rhinoceros, the animal had no horn." BBC News report further says that, "Although fossil remains of Baluchitherium have been discovered before, a near-complete skeleton has always evaded palaeontologists. The fact that the Baluchitherium was able to live in Baluchistan is giving scientists clues about the climate in the area millions of years ago." In an article written few years ago at www.thehotspotline.com blogger Ali Khan writes, "At a recent function organised by the Pakistan Embassy in Paris which saw the launch of the Pak-France cultural forum, professor Welcomme delivered a lecture on his recent find. He also thanked the Nawab of Bugti, the Bugti people and the University of Balochistan for extending all assistance to the French team. The Nawab of Bugti convinced other tribes to allow the team to work in the area and also provided material and technical assistance to Professor Welcomme’s team." Is There A Baluchitherium Museum in Pakistan? The short answer in NO.